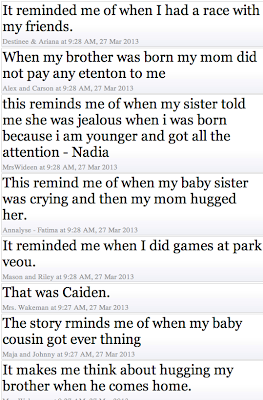 We use padlet.com (formerly, Wallwisher) a lot in my room. We have used it to show our learning at the end of a unit of study, we used it for the Global Read Aloud this past year and invited other classes to comment on the book Charlotte's Web, and we have created a wonder wall to write down our wonders during the day. Today, we used it a little differently. I am currently teaching my students about identifying explicit information in non fiction. I chose the book Frogs by Gail Gibbins to model this strategy because I knew my students would like the topic and that some would have some background knowledge on frogs. I wanted to start with a KWL chart, however, in grade 1 many of my students get restless before we get the K finished..... I have used sticky notes for the chart, where the students write what they know about the topic and stick it to the chart but by the next day, many of the stickies are laying on the floor or I end up taping the sticky notes to the chart because my students have played with them so much that they don't have any stickiness left! I was on the internet and found an idea on www.technologytailgate.com using padlet and QR codes to create a digital KWL chart. It was a fantastic idea! My students are comfortable using padlet and we use QR codes all of the time with our iPads. I created three different walls on padlet, one for What I KNOW about Frogs, one for What I WANT to know about frogs and the third one was for What I LEARNED about frogs. I then created a QR code that would take you to the wall when you scanned it. I made a KWL chart and glued the QR codes onto the chart. I explained what we were doing to my students, they got their iPads and partnered up with another student (We have 20 iPads and I team teach with another teacher, so there are 40 students) and they scanned the QR code for the What I KNOW wall. I would suggest having more than one QR code to scan because I had 2 and it took a couple of minutes for everyone to scan it. I loved doing the KWL chart this way! All of the students contributed to the chart and everyone was ENGAGED! No squirming on the carpet, no one waiting forever to be called on to add to the chart, they were all adding and reading the chart in real time. (I also had the wall projected, so the kids could see it on the big screen.) Students were making connections to other students, saying, "I have the same schema as Annalyse or I know that tadpoles ride on the dad's back because I read it in a book yesterday." We then moved onto the W part of the chart. Students again went up and scanned the QR code and started typing what they wanted to learn about frogs. On padlet you have 2 choices on the layout. Free form where you can place your comment or question anywhere you want or stream where the posts are placed one below the other. We tried the stream for the second wall but because the stream kept moving we had to change it to free form because my students kept losing their spot when they began to type. Tomorrow I will finish my lesson and the students will complete the last wall about what they have LEARNED. This is a time when all students can create their own inquiry question and answer their question by researching and creating some sort of final project to show to their classmates. When I first introduced genius hour, we did a lot of wondering and coming up with questions. I ran into some problems at the beginning because my grade 1 and 2 students were coming up with questions that we could answer in about 2 minutes by googling it. We then talked about coming up with "meatier" questions and we talked about how they would create a final project to share with the class at the end of the inquiry. Joy Kirr has put together a fantastic Livebinder resource for genius hour with resources for teachers and videos to show your students explaining genius hour here. Students then started brainstorming what they wanted to learn about. We then hung up all of the wonder and idea posters and tried to group the students into similar groupings. My teaching partner and I needed to do this due to the age of our students. We knew that all of the groups would need an adult to help supervise each group. We grouped them into the following groups: book making, building, knitting, baking/cooking, and painting/sculpture. We recruited our vice principal, 2 DSW's and my teaching partner and I to facilitate the groups. We also had the students write down what materials they would like for their projects. We told them, it was more like a wish list and that we would do what we could to get as many of the materials on the list. Students were also asked to write out their inquiry question, their plan, the materials they would need and an idea on how they would present their learning to the class. Last Friday, we put them into their groups for the first time to plan and research. The knitting group learned the basics of knitting. The students that wanted to learn about a certain animal or topic started to do their researching in the library. Some students started watching videos on youtube. This student is learning how to do different magic tricks. I love how she is taking notes! At the end of the day on Friday, (genius hour is the last hour of the day on Fridays) my students were groaning that they had to go home. They were just getting started and were so excited! I had many question if they could take their research home, and the library books they checked out. I also had many of them ask if they would be given time to work on their projects on Monday. I have been doing a lot of thinking about what I want my classroom to look like and how I want it to run next year. Is it possible to have a "genius curriculum" most of the day instead of having it one hour a week? Could I cover the curriculum I need to cover in this way? Could I physically do it by myself? My students are so young that they need a lot of guidance and help. However, I have grade 1 students thinking critically about their chosen projects, researching above a typical grade 1 level and asking if they can do it for homework! This past weekend, I ordered a few more inquiry books from amazon so I can continue my professional learning in this area, and start playing with the idea of expanding genius hour to possibly an hour a day or more. I would love to hear your thoughts on the topic. Our current math unit is measurement. I know that most of my blog posts are about how I am integrating technology into my classroom, however, this is not one of those posts....There are times when you need to use manipulatives and tools that are not on the iPads. Yes, there are apps for measuring on the iPads, but my students need to know how to properly compare lengths accurately and use a baseline when comparing the lengths of objects. You can't learn that from using a computer or iPad, students need time to explore and use materials they choose to measure different objects. 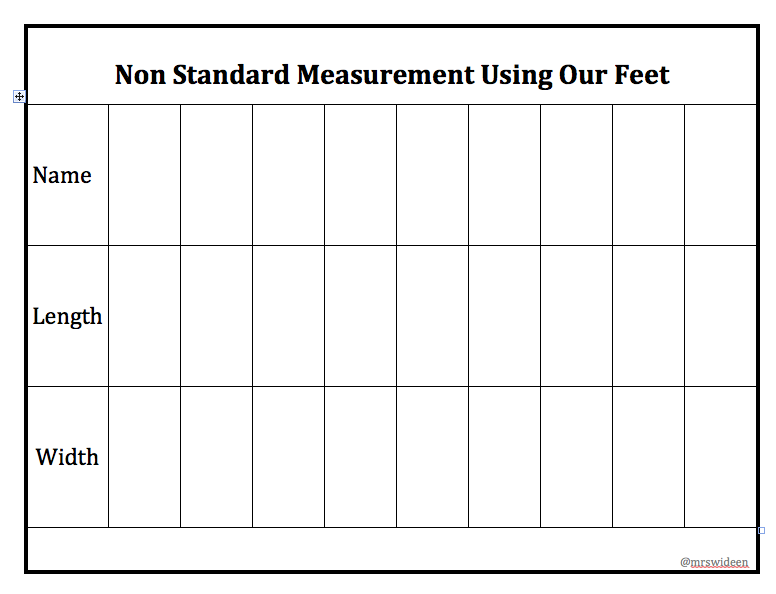 I have a grade 1/2 class, the grade 1's expectations are to measure in non standard measurements and the grade 2 expectations are to measure to the nearest centimeter. 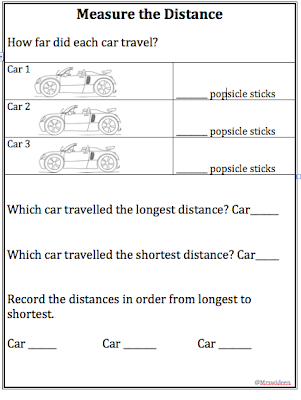 Both grades need to be able to estimate, compare and record lengths. Therefor, the activities that I am going to share with you can be done in either grade. My younger students are using different objects to measure and my older students are measuring and recording linear measurements using both non-standard and standard units. This was an introductory lesson to our unit. I teach in a open concept school. This means there are no walls or doors dividing my classroom to the classroom next door. We put all 3 classes together for this lesson. So when you see the pictures.....I don't really have 60 students in my classroom, there are 3 teachers also. 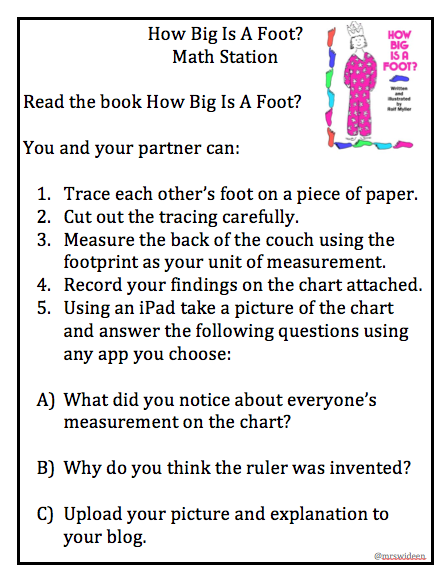 I began the lesson by reading the story, "How Big Is A Foot." The King wants to give the Queen something special for her birthday. The Queen has everything, everything except a bed. The trouble is that no one in the Kingdom knows the answer to a very important question: How Big is a Bed? Because beds at the time had not yet been invented. The Queen's birthday is only a few days away. How can they figure out what size the bed should be? We then chose 2 people from each class to trace their foot onto a piece of paper. We ended up choosing the person in our class with the largest foot (the teacher) and the student in the class that had the smallest foot. In the story the bed had to be 6 feet by 3 feet. We made 18 copies of each foot and had the students cut the feet out. 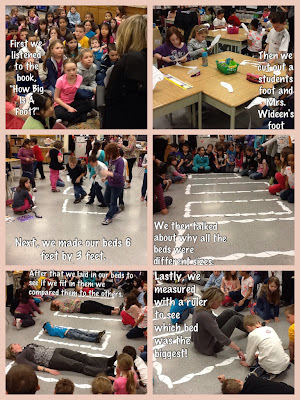 We then made the beds and discussed why the beds were all different sizes and we answered why we thought the ruler was invented. To extend this activity I made a math station for my students to do independently. If you are interested in using this station you can download the instruction sheet here and the chart here. In art we made spring gardens. Students were given a sheet of paper with different sizes of rectangles on it. They were instructed to draw flowers in the boxes. Then, students cut their flowers out, glued them on construction paper and either measured their flowers with cubes or a ruler and recorded their findings. 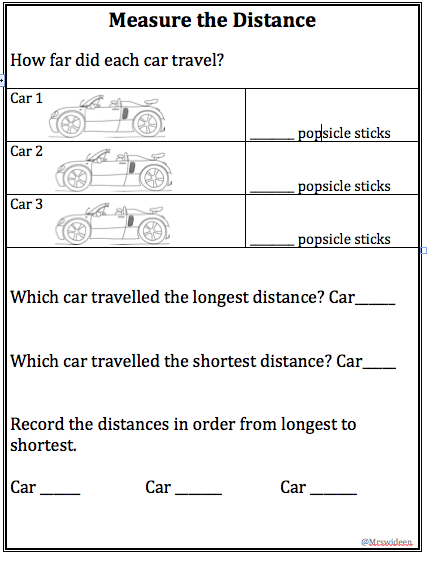 The last measurement activity we did this past week started with this problem prompt: How can you find out which of these three toys travels the farthest past the ramp? 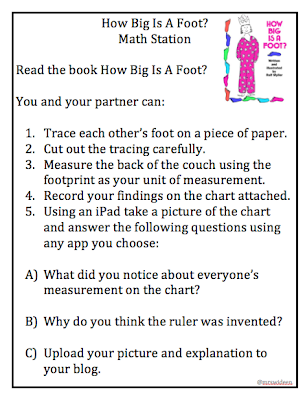 If you would like the recording sheet to this activity you can get it here. 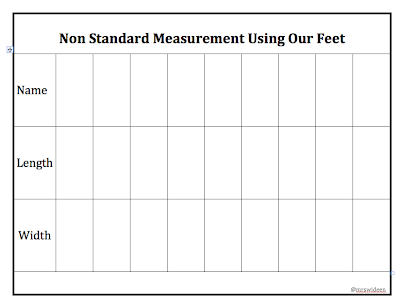 I hope you have as much fun as we did completing these measurement activities. Over the course of the last 4 years I have transformed as an educator. I previously was a kindergarten teacher, who taught routines and was fearful of change and what it meant to our routines. I then began teaching grade 1 and wanted to change the way I delivered my message more over I wanted learning to be enriched. There have been 4 contributing factors to the change of the environment in my classroom. My mindset, my students’ mindset, the social space and the physical space. It is my goal as an educator to foster discovery and reflection through the dialogue and sharing of ideas. Our classroom learning space stems from this goal: Our entire space was designed as a free and open area where learning is facilitated by student need. The iPad cart is open for students to freely use to update their blogs and select the application that serves their learning need. Our room is equipped with a projector, and an Apple TV so student creations can be shared with each other, with other classes and worldwide. In order to have a positive social environment, I honor student voice and model positive interpersonal relationships. I empower students by facilitating their learning through collaboration with each other and me. Students in my class feel a sense of belonging in our classroom community. This empowers them to take risks and explore new ideas. My students have been taught to listen carefully to each other. Students are given problems that are relevant and important to them. Students often need to collaborate with outside experts through Skype or Google Hangout. My students also use collaborative tools like wikis, and blogs. By giving them the choice on what they learn about, they are intellectually engaged. I center our learning goals on the big ideas and key concepts across the curriculum areas rather than limiting the students to one topic or curriculum expectation. Learning is art, science, physical and virtual, local and global. My students come to me as technology consumers. My job is to teach them how to become content creators. Many of my students have iPads or iPods at home already. They expect learning to be fun. My students come to me with curiosity and I embrace that curiosity through project based and inquiry based learning. If you step into my classroom you will quickly find out that we are a classroom with no walls. Video conferencing, blogging, creating videos and books, teaching and learning from other peers in the classroom, in the school and in the world about what they are interested in is embedded into the daily instruction of my classroom. The results of this purposeful connectivity is that my group of grade1/2 students have begun to develop a global perspective of issues that could not have been authentically discovered if they were solely engaged in books in our classroom. I have not done this alone. I have a personal learning network of many like-minded educators who I have sustained learning relationships with. My students embrace change and I embrace change. As my teaching methods and the technologies I use continue to evolve, the transformation of my learning environment will continue as a journey, not a destination. I really think my teacher just thought if we did anything besides sit there and be still we wouldn't be able to pay attention to the story. But in fact the opposite was true. Now I'm not saying that every child in my classroom is 100% engaged while I am doing a read aloud.... However, I know it is a very high percentage of them. I know this because they are showing their thinking while I am reading to them. I have worked very hard this year on modeling explicitly how to show their thinking while reading. Not just with read alouds, but with independent, shared, and partner reading. From this modeling, I am confident that my students are thinking critically while they participate in our read alouds. they can make connections, ask questions, visualize, write down vocabulary they are unsure about, write about their feelings, write a summary, etc. I remind them about all these ways, then I let them go at it while I read. I use todaysmeet instead of sticky notes, a notepad, or an iPad a lot lately because it gives them a little push to write. I like todaysmeet because students can see who is writing the comments, other students can read and comment on other students' comments and it is a closed environment. All I do is set up a room, hand out QR codes that take them to the correct URL and they show their thinking while I am reading. My students love to close their eyes and visualize the pictures in their heads, they often sketch in their notebooks or on the iPad what they are visualizing. 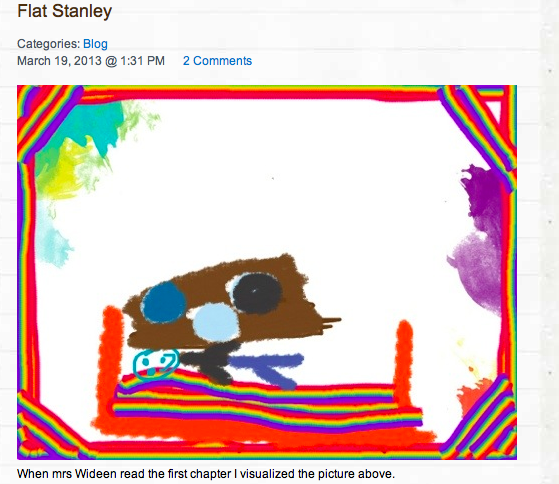 Here is an example from a student who drew a picture on her iPad, then uploaded it to her blog. We have a classroom Twitter account, so students can tweet out things that we are doing, or respond to what other classes are up to. 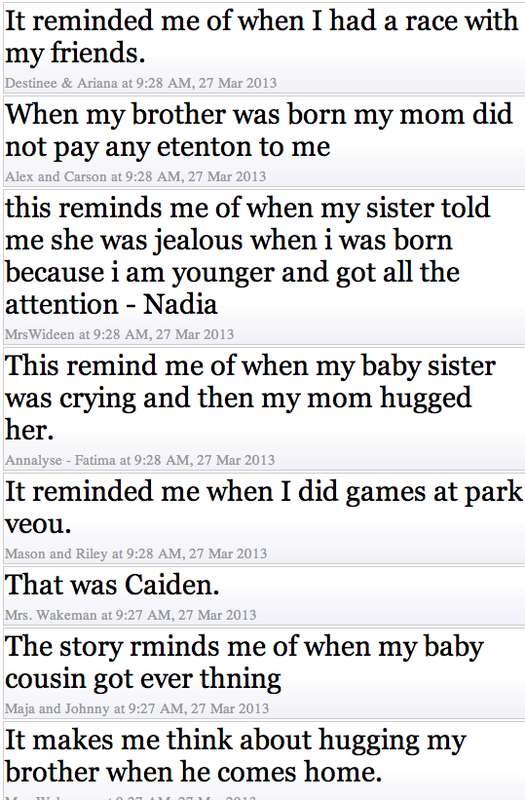 One of my students tweeted about reading the book Clementine last week and we had responses from many other classes that are also reading it. We are currently reading the book Clementine. There are 18 other classes reading it at the same time. We put a tweet out on twitter to see if any other classes were interested in reading a chapter with us. Last Wednesday we read chapter 2 with another grade 2 class. 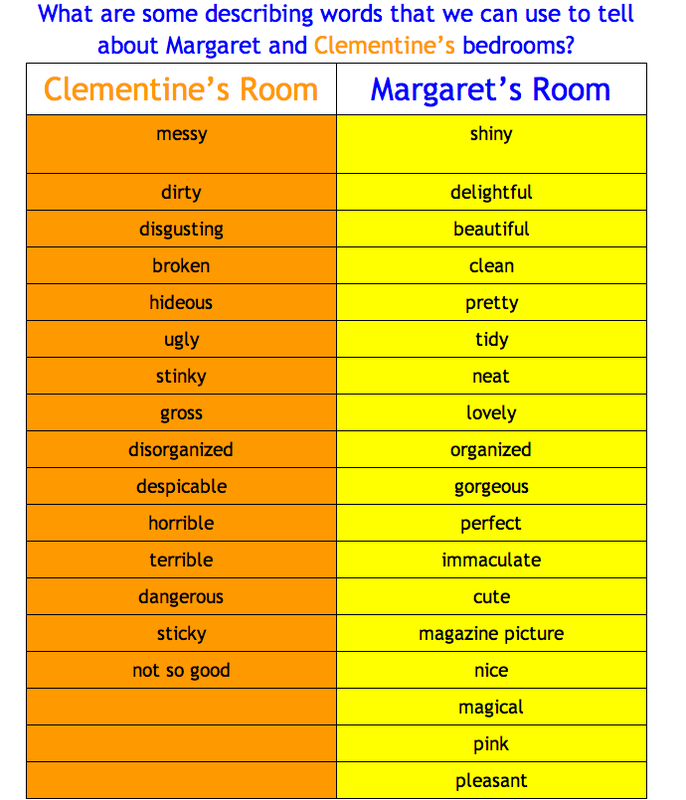 This led to a google doc being shared with us comparing the two main characters bedrooms. Both classes added to the google doc below. Reading the same book at the same time with several other classes is exciting. Not just for the students, but for the educators too! You can collaborate on projects, share resources, and have so many more options to extend the text. 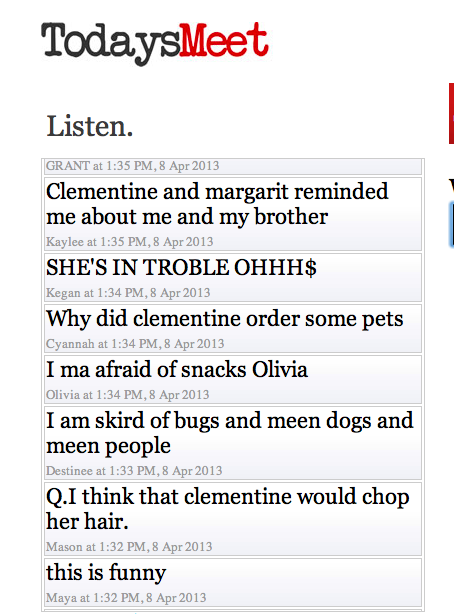 My students are currently on Edmodo discussing the book Clementine with 2 other classes. They not only have their classmates to discuss the book with, but they have other students from around the globe to collaborate with! Here is the link for The Global Read Aloud 2013 . They are currently voting on which books we will be using. You can also check on Twitter. I was lucky enough to see a tweet from Louise Morgan - the #2ndchat moderator (@MrsMorgansClass) announcing they were going to do a global read aloud on the book Clementine, and I signed up! 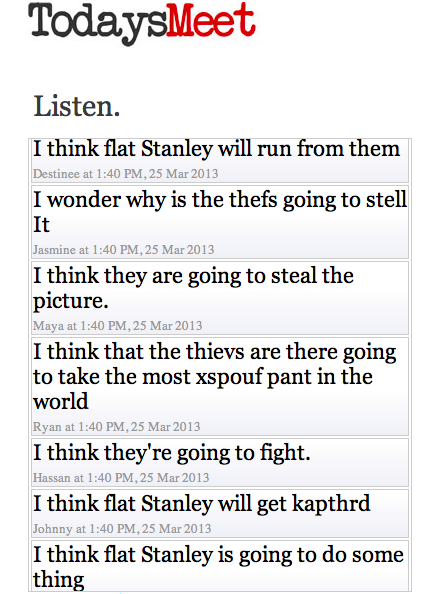 I had Jenni Van Rees (@jennivanrees) contact me about us "hosting" one of her Flat Stanleys' for a month. I of course accepted. Jenni created a blog for the Stanleys' going out and gave us directions on how to get on the blog to document our adventures. 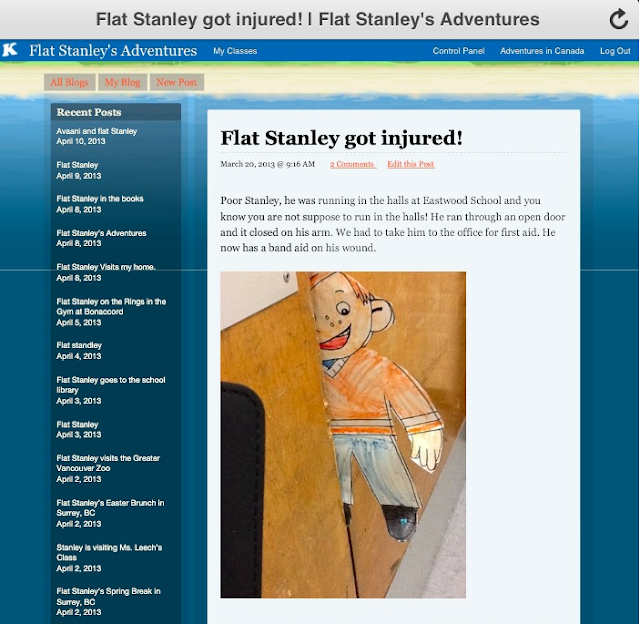 Since I knew we would be receiving Stanley, I started reading the first Flat Stanley Book. My students loved the book! What they loved more though, was thinking of adventures and taking pictures of Flat Stanley at our school. I even had a child bring in the second book for me to read to the class for our next read aloud. Tomorrow, we will be Skyping with Mr. Deluca's (@MrJDeLuca) grade 2 class. Mr. Deluca will be reading chapter 4 of Clementine to us. My students love to hear how other people read to them. Will Mr. Deluca make different character voices? Will he share some of his connections and thinking with us? It will be a surprise! What are some of the exciting things you do to engage your students while you read to them? My classroom, for the most part is paperless. My students do not have notebooks, or binders, or folders that contain copious amounts of paper that will end up in the recycle bin as soon as they are able to bring it home. My students sit at desks, however, they rarely use the inside of them. My students all have a book box that contains the books they are currently reading and a writer's workshop folder that contains a few pieces of writing they are currently working on. For the most part, students' work is stored on our iPads using Dropbox, Kidblogs and Youtube. I wanted to offer my students a way to share their thoughts, feelings, questions, and problems. I also wanted to encourage my students to express their thoughts about what is going on in the classroom and at home. I wanted them to have an option to keep their work private from their classmates. I wanted them to learn that not everything they wrote or produced was intended for an audience. Notebooks were a great idea, however, we have 20 iPads and going to my administration to ask for money for notebooks was not something I wanted to ask for. I searched the app store and asked my PLN for any suggestions for "diary type apps." I bought a couple to try and was pleasantly surprised with the iDiary for Kids app. This app allows students to write personal entries, upload photos and draw pictures. The journals are password protected and you can have multiple users on the same app. When you first open the app students fill in their name, password, email(we did not add an email) and Title of their book. They get to choose their cover color, picture and text color. Once students have filled out the preferences page and saved it, they can enter the app, and choose the book they want to work in (if you have more than one student using the iPad or the student has more than 1 book you can have multiple books on this page). The student chooses their book and enters their password. 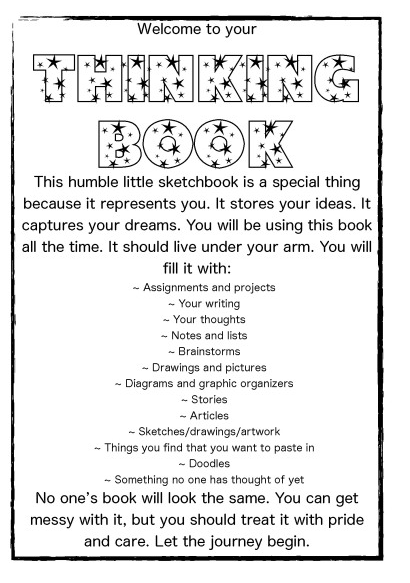 The book opens to the current date and the student has the option to write, draw, or upload a photo to their book. A great addition to this app is when the student starts to type, the book automatically enters a time stamp to the page in the column. I took his idea and started modeling to my students different ways to use their thinking books. Their thinking books have now become their everything books! They doodle, they pose questions and answers, they sketch what they visualize while I'm reading to them, and they use it as a journal and take pictures of their work. Some of my students have been taking screenshots of things they want to share with others and posting them onto their blogs. They love that they now have the option to share or to keep it to themselves as they work through their thinking process. One of my grade 1 students said to me today, "Mrs. Wideen, our thinking books are like our blogs, but we can choose our audience for our thinking books. It could be a friend, the teacher, the world if we post it on our blog or just ourselves. I like that we have the choice." This past week, we welcomed the Early Years Teachers, Our Vice Principal, and our grade 1 teacher in to see how we incorporate our iPads and technology into our classroom. We showed our guests how we use a website called TodaysMeet. This website encourages the room to use a live stream to make comments and ask questions (Sort of like Twitter, but it is private). I have used this in professional PD before and I knew that my students would love to try it. I created a room (gave it a name and chose to keep the room open for 1 month) and then created a QR code with the web address so my students could quickly scan it using their iPads and it would take them to the site. We have been working on making meaningful connections the past few days in class so I asked the students to make text to self connections while I read the story Koala Lou. Our guests were amazed at the engagement of this lesson. My students typed feverishly while I read Koala Lou. I stopped periodically through the story to make my own connections and to give my students time to add their connections. You could hear a pin drop in my room during this activity. When we concluded the activity, I told them we would come back to their connections the following day to figure out which kinds of connections help us the most. My students couldn't wait to follow up the next day. 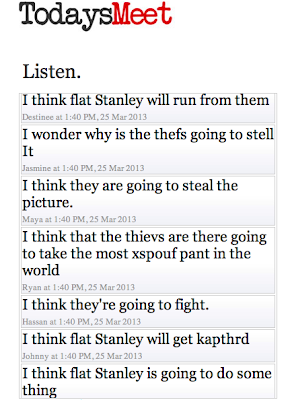 I have also used TodaysMeet to encourage predictions, ask questions and inferring. While I read our current read aloud (Flat Stanley) students were encouraged to read the other responses on todays meet and to take the conversations of the book deeper. Children began to collaborate to infer answers, solve problems and construct meaning. I love to hear, my students ask, "Can we use TodaysMeet today while you read to us?" Have you ever used TodaysMeet? I would love to hear how you are incorporating it into your classroom.